For 2018 we'll focus on three areas where finesse is key in cornering: changing steering, changing braking, and changing throttle in corners. 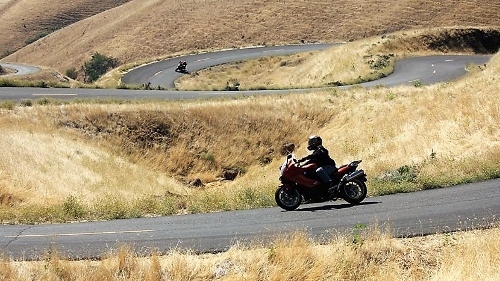 Sport and touring riders often find themselves on unfamiliar roads where a mid-corner change may be needed to keep things going the way you want. Being able to confidently make changes mid-corner opens up more possibilities and makes the ride more fun. Looking forward to riding with you on the historical Mary Hill Loops Road! This Saturday morning clinic requires a separate registration. Jesse Murphy and his team from Truitt Motorcycle Education and Cascade Motorcycle Safety will run the program once again (3rd year in a row). We hear nothing but positive things about this clinic year-after-year. 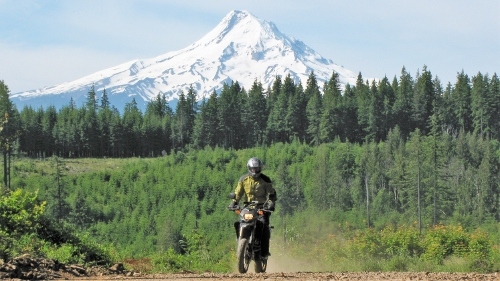 For our dual sport crowd, we've got several routes that provide stunning views of Mt. Hood from wherever you are on the trail. And because you asked for it, you'll be able to choose routes that go from gnarly to nice. You decide. Arriving on Wednesday when the rally starts and don’t want to forage for food? The Sound RIDER! Onsite Café has you covered. 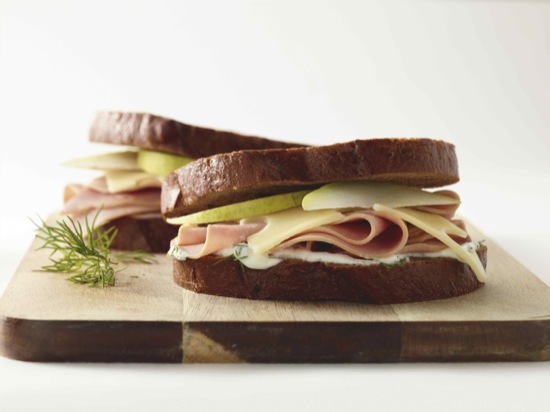 Lunch options include our delicious ham and cheese sandwich with sliced local fruit, Sam & Sam’s award-winning chili dog chili, 100% grass fed hot dogs and our exclusive green salads that were such a hit last year. Start enjoying the Rally immediately! (Wednesday is the only day lunch will be served.) Beverages will also be available for purchase. Looking for some delicious breakfast and dinner options the rest of the time? It's under control with breakfast Thursday - Saturday and dinner Friday and Saturday. And don't forget the Thursday night Burger Feed and Sunday morning Pancake Breakfast - both included in your price of admission. 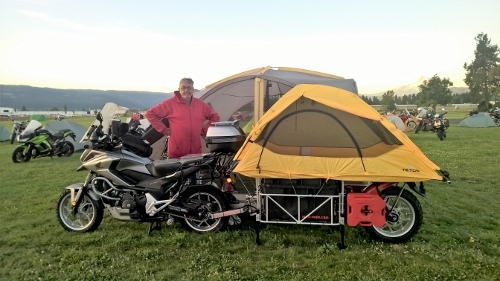 Get the most out of your Rally experience: be onsite when you’re not riding. With an abundance of grass tent camping and a clean and warm shower/bathroom facility with plenty of hot water at no charge, and RV spaces with hook-ups, you’ll be in the midst of the action. Both tent and RV spaces are near each other, Rally buildings, and the Sound RIDER! Onsite Café, creating a rally community. We charge you what the Fairgrounds charge us: it’s no money-maker, we just want you onsite! For those looking for a hotel/motel/B&B experience, we have a full list, Click here. European Motorcycles of Western Oregon (Eugene) and BMW Motorcycles of Western Oregon (Tigard) have supported the Rally for years and are part of the fun again this year. Owners Scott and Madelyn Russell are riders themselves and understand what you need for excellent rides, short or long. 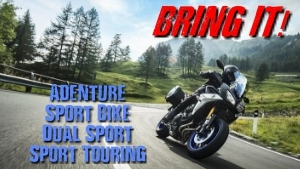 Check them out for new or pre-owned bikes, gear, accessories and service. Racer Gloves USA is the importer and distributor for the Austrian motorcycle apparel brand Racer Outdoor GmbH, recognized throughout Europe as makers of the best fitting gloves you can buy. Riding is a life-long passion for owner Lee Block, including road racing, although his collection of bikes include street, road-race, and off-road. These gloves ensure a safer and more comfortable ride, no matter what you ride or where. If you have other riding friends who need to know about the rally, be sure to share this email with them. 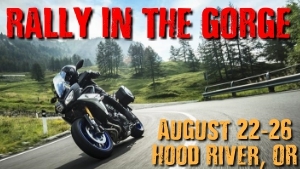 Subscriber Services: You are presently subscribed to the Rally in the Gorge newsletter which provides information about Sportbike Northwest, Dualsport Northwest and Sport Touring Northwest. If you enjoy getting this newsletter and want to share it with others, please forward it to a riding friend or two.